Official Notice to Appear, as of 2013. The shaded areas indicate spaces that can be modified for local or agency requirements. Unshaded areas may not be modified. 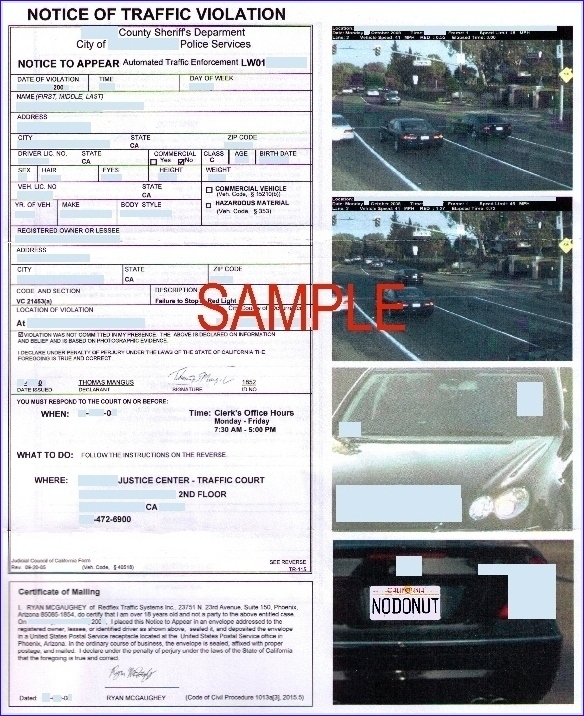 The most current version will be available on the website of the Judicial Council of California. The Judicial Council provides separate instructions for the Notice to Appear, and they get very specific. 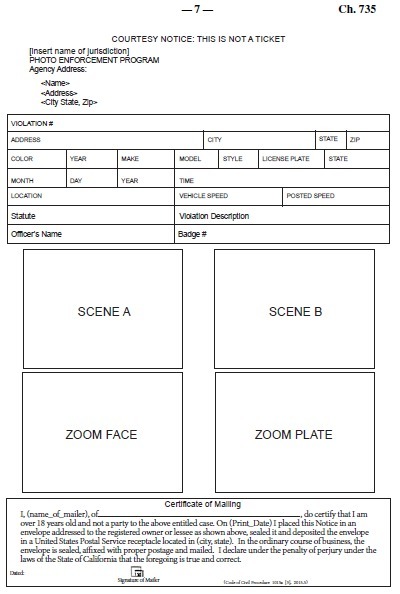 there is a separate official form for the fake/Snitch tickets, with a very different layout - see above. ... but there is no law specifying the layout of the rest of the page. As a result, there can be a lot of variation, discussed below. This is a what a real ticket by RedFlex looks like. 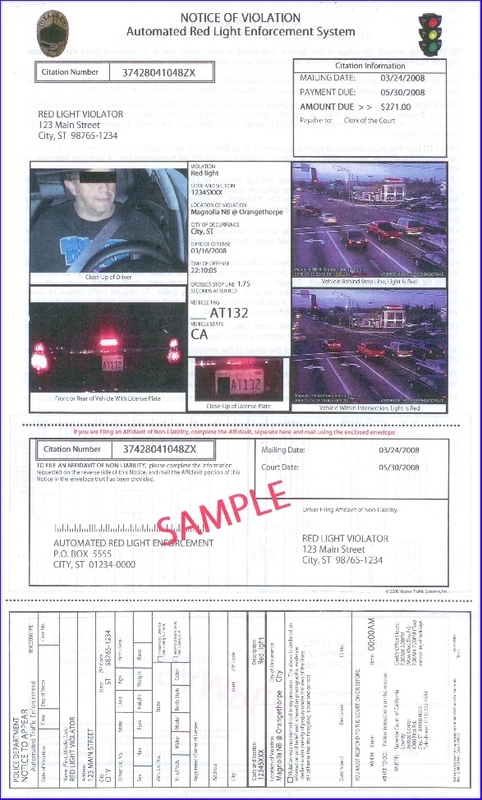 It includes the required Notice to Appear form, four photos in a column on the right, and a "Certificate of Mailing" declaration designed by RedFlex and executed by a RedFlex employee (see Defect # 8). 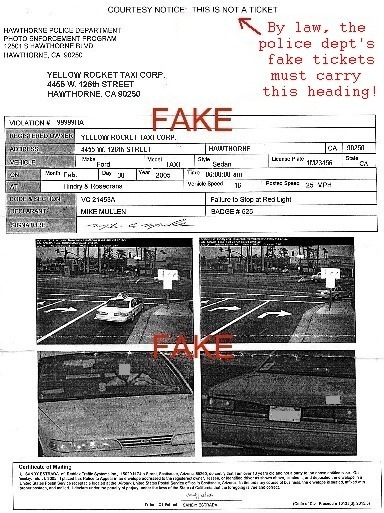 The top three-quarters of the real ticket below (which was printed on 8-1/2 x 14 paper) looks a lot like a fake/Snitch Ticket. The only solid clue telling us that it is a real ticket is the presence of the Notice to Appear section - sideways at the bottom of the page! 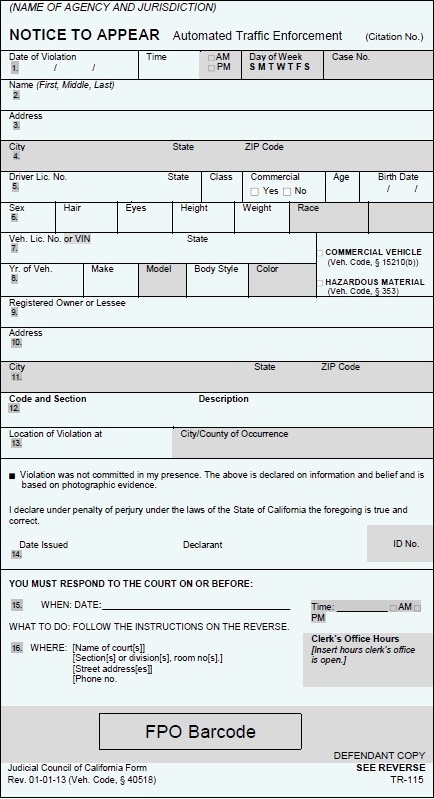 Unlike the RedFlex ticket above, there is no "Certificate of Mailing" declaration signed by a company employee. "Crossed stop line 1.75 seconds after red." Here is a page with stories from people who have dealt with their Snitch Ticket.